When will the asteroid skim past Earth? Closest approach will be at 21h24 SAST on Friday 15th February 2013. This diagram shows it's orbit viewed from above the solar system and a side-on view. Can it be seen from South Africa? The asteroid path takes it from the southern side of Earth through to the north. This trajectory will be over the Indian Ocean and in particular over India. Viewed from India it will pass overhead. To see it from South Africa, we therefore need to look in the direction of India, that is towards the east over our eastern horizon. You will need a clear south-easterly horizon because the asteroid will not be more than 25 degrees above the horizon. Seeing it will be a challenge - Good Luck if you do try. The further east you are, the better chance you will have. See this visibility chart. This sky chart below from a Sky & Telescope web page helps understand the asteroid's path. Also see Heavens Above. As dusk approaches, the asteroid will move northwards past the Southern Cross (Crux) which will be rising in the south-east. Moving northwards does not necessarily mean moving overhead. In this case, the northwards motion will be around the eastern horizon. At 20h00 DA14 will be a bit more than 20 degrees above the horizon. How much is 20 degrees? On an outstretched hand viewed at arms length, from the tip of your thumb to the tip of your pinkie finger is 20 degrees. The bottom edge of this chart aligns roughly with our eastern horizon on the evening of the 15th. The southern cross will be lying on its side early evening with the top of the cross pointing to your left. This chart gives the position of the asteroid at each hour. Remember that these are Universal Times. Add 2 hours to get the South African time. What do I need to see it ? The asteroid is too faint to see with your naked eye, so get those binoculars out of the cupboard. By referring to the sky chart and watching carefully you should be able to identify DA14 as being the object slowly changing position against the background stars. How quickly will it be moving? - about 30deg every hour. In case it matters to you, its speed relative to Earth is 13km every second. That is 46 thousand kilometers per hour. All things are relative, so saying that DA14 is about 50m in diameter does not mean much. Imagine that the FNB Soccer Stadium is the Earth, albeit a calabash shaped Earth. If the Earth were as big as the stadium, the asteroid would be no bigger than a grain of sand - 1mm in diameter. This tiny asteroid will pass the calabash Earth about 550m away from the side of the calabash. This asteroid is about as big as we think the asteroid was that hit the Earth near Shoshanguve north of Pretoria. No - you did not miss the news about it because that impact was 200 000 years ago. The impact left a nice crater, now smaller than it originally was as erosion fills it up. It is called the Tswaing crater. It would not have been advisable to be within 200km of that impact because bits of Earth that were thrown out of the crater formed some of the hills to the south east of Pretoria. If DA14 hit Pretoria city center, there would be serious damage and loss of life. Could DA14 hit one our Earth satellites? Yes it could, but the chances are very small. Space is BIG. There is lots of ROOM. Even though there are around 13 000 satellites orbiting Earth now, each satellite is rather lonely, being separated by a few thousand kilometers from its nearest neighbours. The asteroid belt between Mars and Jupiter is packed with asteroids - billions of them. BUT - on average they are a million kilometers apart. Yes - space is not called space for nothing. An amateur team discovered the unusual asteroid, dubbed 2012 DA14, on 22 February 2012 . Its small size and orbit meant that it was spotted only after it had flown past Earth at about seven times the distance of the Moon. The asteroid was discovered by the La Sagra Sky Survey observatory . 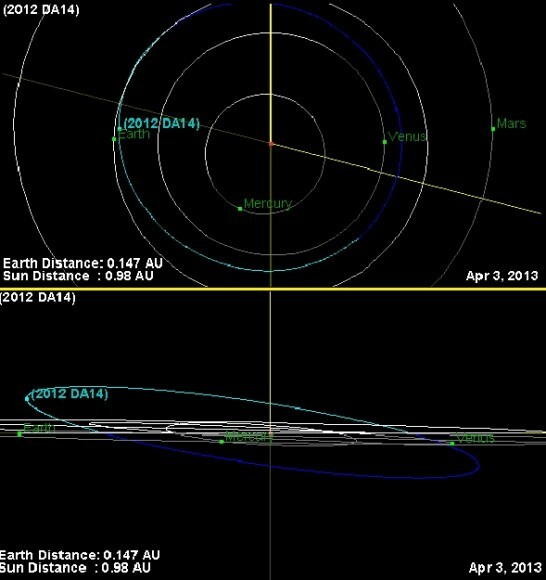 This passage of 2012 DA14 by the Earth is a record close approach for a known object of this size. A few other known asteroids have flown by the Earth even closer, but those asteroids were smaller. On average, we expect an object of this size to get this close to the Earth about once every 40 years. An actual Earth collision by an object of this size would be expected much less frequently, about once every 1200 years on average. With such a close approach to Earth, our planet's gravity will change its future path and rise a chance of future impact. There is an estimated cumulative 0.033% risk (1 in 3,030) of 2012 DA14 impacting Earth sometime between 2026 and 2069. As of August 2012, there had been 848 near-Earth asteroids larger than 1 km discovered, but only 154 are potentially hazardous asteroids . It is estimated that 93% of the NEAs larger than 1 km have been found and that only about 70 remain to be discovered. This table lists some of the upcoming close approaches of near-Earth asteroids - in the 2 weeks only! Note how closer DA14 is compared to the others. As of January 2013, 9,534 Near Earth Objects have been discovered . Objects with diameters of 5-10m impact the Earth's atmosphere approximately once per year, with as much energy as the atomic bomb dropped on Hiroshima. Every 2000�3000 years Near Earth Asteroids produce explosions comparable to the one observed at Tunguska in 1908. Objects with a diameter of one kilometer hit the Earth an average of twice every million year interval. Recent Events - they are out there - we are not alone! On March 23, 1989 the 300-meter (diameter Apollo asteroid 4581 Asclepius (1989 FC) missed the Earth by 700,000 kilometers passing through the exact position where the Earth was only 6 hours before. If the asteroid had impacted it would have created the largest explosion in recorded history, 12 times as powerful as the Tsar Bomba , the most powerful nuclear bomb ever exploded. It attracted widespread attention as early calculations had its passage being as close as 64,000 km (40,000 mi) from the Earth, with large uncertainties that allowed for the possibility of it striking the Earth. On 6 June 2002 an object with an estimated diameter of 10 meters collided with Earth. The collision occurred over the Mediterranean Sea , between Greece and Libya , at approximately 34°N 21°E and the object exploded in mid-air. The energy released was estimated (from infrasound measurements) to be equivalent to 26 kilotons of TNT, comparable to a small nuclear weapon . On March 18, 2004, LINEAR announced a 30-meter asteroid, 2004 FH , which would pass the Earth that day at only 42,600 km), about one-tenth the distance to the Moon, and the closest miss ever noticed. They estimated that similar-sized asteroids come as close about every two years. On March 31, 2004, two weeks after 2004 FH, meteoroid 2004 FU 162 set a new record for closest recorded approach, passing Earth only 6,500 km away (about one-sixtieth of the distance to the Moon). Because it was very small (6 meters), FU 162 was detected only hours before its closest approach. If it had collided with Earth, it probably would have harmlessly disintegrated in the atmosphere. On March 2, 2009, near-Earth asteroid 2009 DD 45 flew by Earth at about 13:40 UT. The estimated distance from Earth was 72,000 km, approximately twice the height of a geostationary communications satellite. The estimated size of the space rock was about 35 meters wide. On January 13, 2010 at 12:46 UT, near-Earth asteroid 2010 AL 30  passed at about 122,000 km). It was approximately 10�15 m wide. If 2010 AL 30 had entered the Earth's atmosphere, it would have created an air burst equivalent to between 50 kT and 100 kT. The Hiroshima " Little Boy " atom bomb had a yield between 13-18kT. On June 28, 2011 an asteroid designated 2011 MD , estimated at 5�20 m in diameter, passed within 20,000 km of the Earth, passing over the Atlantic Ocean.